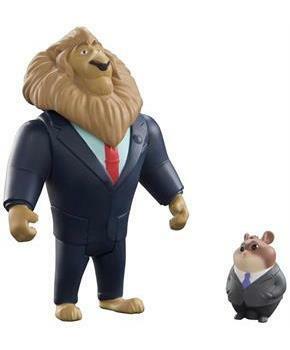 Mayor Leodore Lionheart is Zootopiaâ€s bold and noble leader. It is because of him and his mane belief that anyone in Zootopia can become anything - lemmings can be successful businessmen, and Judy Hopps can become the first bunny cop. The poseable 3.5â€ Mayor Lionheart Figure and 1â€ Lemming Businessman Figure are in scale with all of the other Zootopia Character Pack Figures. Collect the entire herd of the Zootopia Character Pack Figures and Vehicles so you can recreate the scenes from Zootopia!